I am sure a lot of my fellow riders out there have heard of the Fastback WP Riding Shoes from Alpinestars. Well what if they brought this shoe Back and it was even Faster? You see what I did there….yikes, tough crowd. Alpinestars gives us the new and improved Fastback WP Riding Shoes for 2015. The new Alpinestars Fastback WP Riding Shoes should prove to be a solid option if you are ripping around the city or for those daily commuters that do not want to wear their space boots to the office. You can always leave a spare set of shoes in the office but hey, thats not the point. The updated shape of the boot should provide better grip on the bikes controls and provide that great tactile feel we all desire. Alpinestars has also thrown in some microfiber Achilles insert on the rear collar for superb flexibility on and off the bike. The Fastback’s will also have a guaranteed waterproof membrane layer between the upper and lining of the shoes incase you find yourself riding in inclement weather. They also added some reinforcement throughout the shoes to even further the protection these bad puppies are going to offer. I would not recommend taking these out to the tracks but they are Cat 2 CE certified just in case you were wondering. Astars did not simply stop at upgrading the the Fastback shoes, they have also introduced the new Alpinestars Monty Boots with a lot of the same great protection but with a totally different styling. These are designed to be worn everyday and could be a perfect option for those commuters and urban riders who do not desire to wear storm trooper boots. The Toe, Heel, and ankle are all going to be reinforced for added protection. The upper is hand-finished, rear leather accordion collar for comfort, and they come equipped with a heel pull tab designed not to catch the back of your pants. I have plenty of boots that have a large tab at the top which can be simply annoying depending on the length of your jeans. Additions like these can be very subtle but small details like this show the design and functionality behind the product. The gusseted tongue works really well at keeping out the wind, water, and dirt while riding and simply walking around. These boots should prove to be comfortable on and off the bike, stylish, and protective. Alpinestars is coming in hot for 2015. Bravo Alpinestars, Bravo! They took an already great pair of Fastback riding shoes and found a way to make them better. 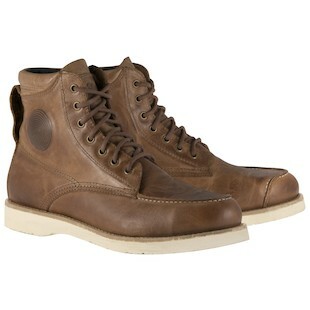 Lets not forget about the great addition of the Monty Boots as they will also be a solid option for those urban riders. 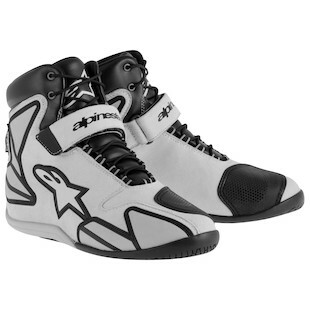 I would certainly keep an eye out for the Alpinestars Monty Boots and Fastback WP Riding Shoes. Perhaps they will find themselves into your ever growing closet of gear. Your wallet may get a bit thinner but your feet will probably thank you for it.